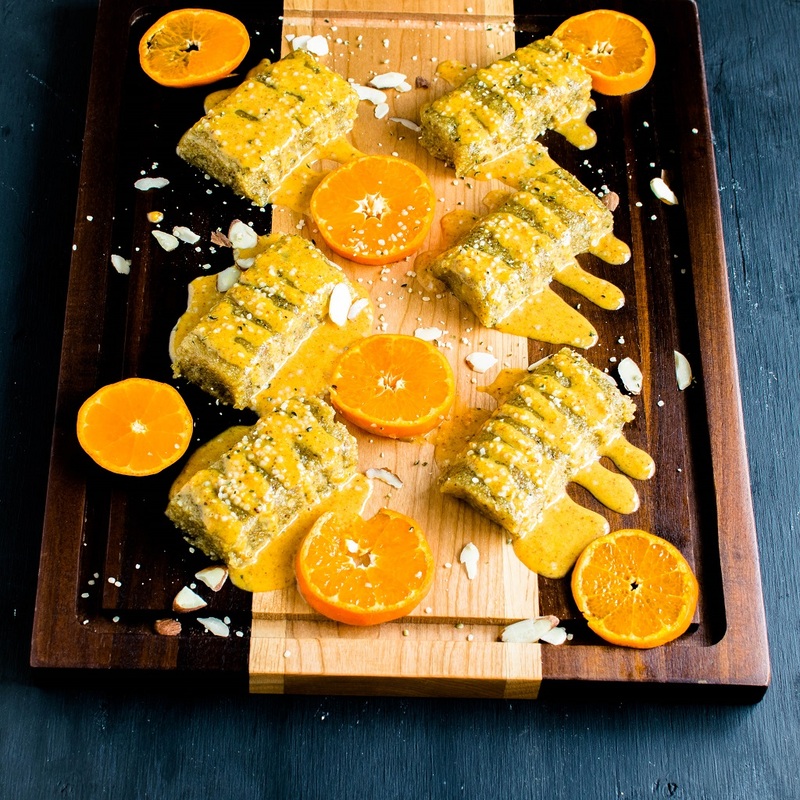 No Bake Orange Almond Protein Bars are perfectly sweetened and are moist, soft and chewy. These are vegan, gluten free and paleo. Moreover, these bars are suitable for all types of diet and for kids as well. They have a cake like texture so the little ones can chew and swallow them easily. These bars are great to include protein in your family’s diet. I love making protein bars at home. They are more cost effective and I know my ingredients as well. Also, it gives me the opportunity to vary the sweetness as per my taste and add any flavor of my choice. No Bake Orange Protein Bars are a great post work out replenishment or a great on the go breakfast. I have been craving orange flavors lately. However, I love the fresh mandarin oranges with natural flavors. I have already tried a ganache recipe with oranges infused in cookies. This time I wanted a pure orange flavored protein bars. Also, I did not want to overwhelm my protein bars with orange flavor. Therefore, these protein bars have subtle orange flavor and are mildly sweet. These are absolutely my favorite bars that match amazingly with my desires. This time I made Yashvi my recipe taster because I wanted an opinion from a kid’s point of view. If nuts are not a problem then these protein bars are super nutritious for kids. Generally, children are not very good eaters and tend to derail from a balanced healthy diet. So, with kids in my mind I was super excited to come up with this No Bake orange Almond Protein Bars. I know majority of the children love oranges and this is a great way to introduce so many heathy ingredients into their diet. So, I tried with and without the frosting bars with Yashvi. She liked the bars that had lots of frosting. Therefore, I would highly recommend whipping up the orange frosting and drizzling generously for the zesty orange flavors. I love No Bake Orange Almond Protein bars because…. I am sure you will love these protein bars as much as we do. Also, if you get a chance to make these awesome and beautiful bars please leave a feedback below in the comments and rate my recipe. 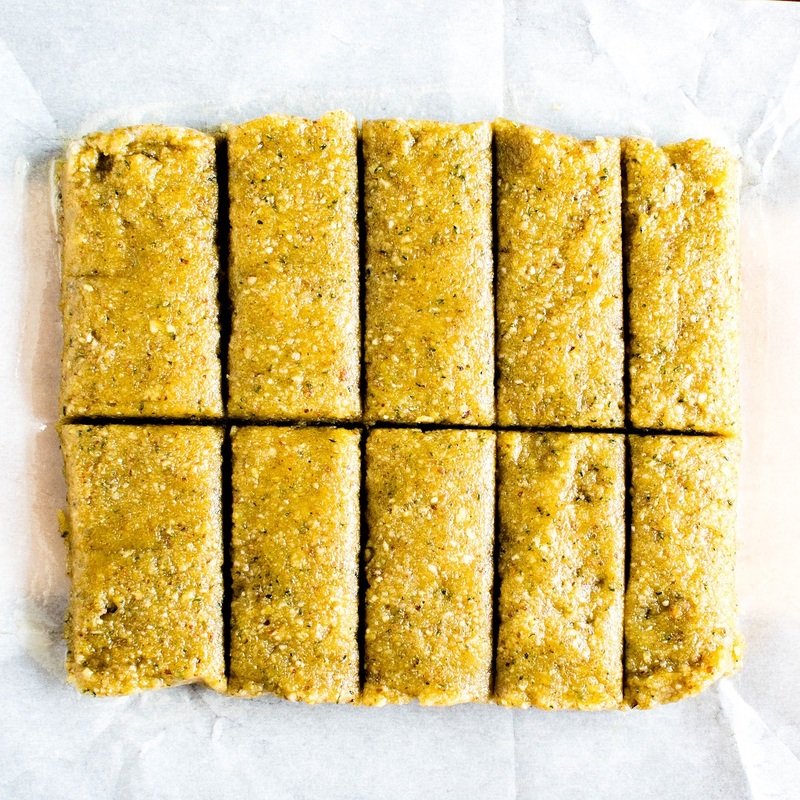 No Bake Orange Almond Protein Bars are perfectly sweetened and are moist, soft and chewy. These are vegan, gluten free and paleo. Moreover, these bars are suitable for all types of diet and for kids as well. In a blender combine the peeled oranges and blend until smooth. Then strain it in a large mixing bowl. 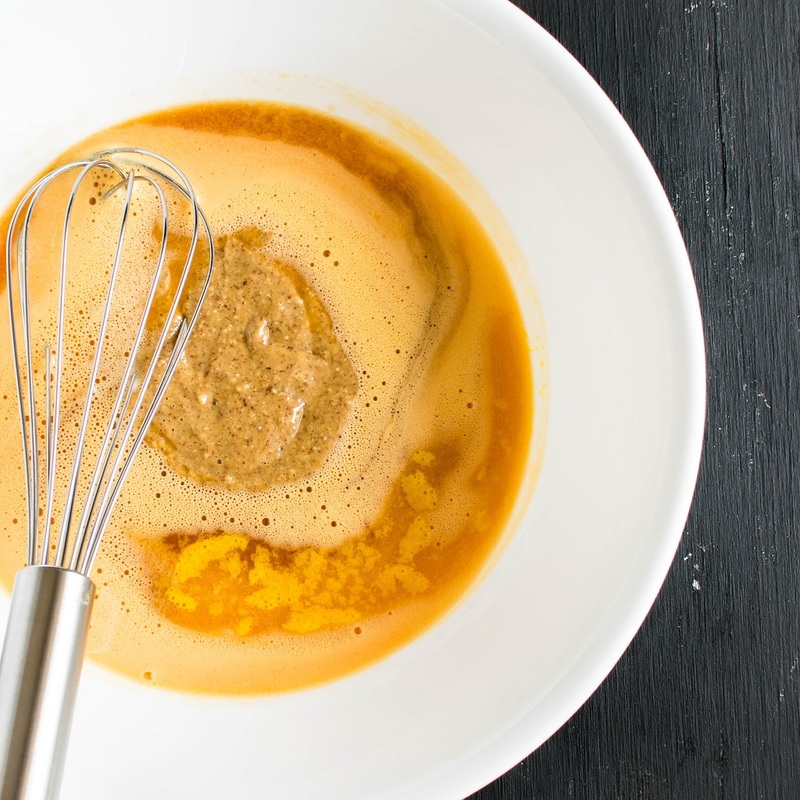 Then combine maple syrup, vanilla extract, orange extract, almond butter into the orange juice and whisk it very well. Keep it aside. In a food processor combine slivered almond and hemp seeds and grind until it’s in a powder form. Now fold in the hemp mixture, almond flour and salt into the wet ingredients and mix it well with a spatula. Feel free to use your hands to make it well-blended dough. Now, prepare a square or a rectangle small bowl with a greased parchment paper. Spoon the batter onto the prepared bowl. Then, grease your palms nicely to avoid the sticking of the dough. Spread the dough evenly in the bowl and place it in the freezer for 30 minutes. In the meanwhile blend one orange again in a blender and strain it in a small glass bowl. Then add rest of the frosting ingredients in the orange juice and whisk it very nicely. Place the bowl in the freezer for 20 minutes. Take out the bars and slice them into 10 pieces. Drizzle the orange frosting on the bars and enjoy. Refrigerate these bars in an air tight container for a week. These are soft and chewy bars. However, they eventually bind well in the refrigerator. If you like fresh orange flavor then feel free to squeeze few drops of fresh orange after applying the frosting and before storing them away. these sound insanely good and soooooo easy to make, can’t wait to try them! These are indeed super simple and easy. This looks to die for! I love the combo and the ingredients are already in my kitchen! Thank you Madison. I hope you like this recipe. Also, please give me your feedback and don’t forget to rate it as well. 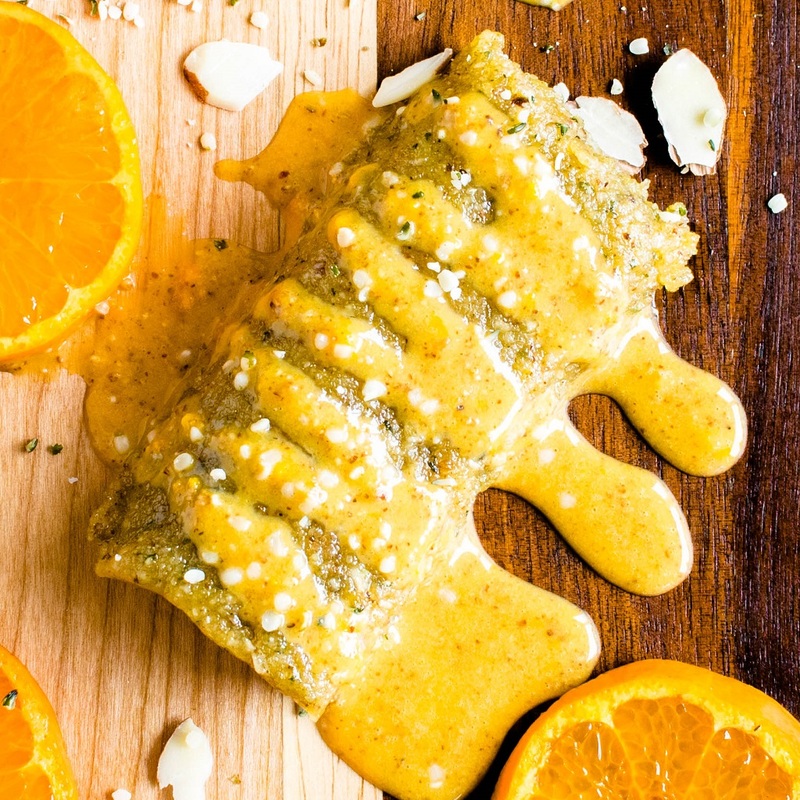 I love that these include fresh oranges – really makes this recipe stand out from other protein bars. Thank you Liz. I hope you get a chance to makes these protein bars. Go for it and let me know how it turned out for you. It’s so smart to make your own protein bars. They are expensive when you buy store bought! Plus I love that you can control the ingredients. Many of them are glorified candy bars! I think orange and almond are such phenomenal flavors and putting them together makes it even better. These look super tasty and I love that you don’t have to bake them! I am going to have to make these asap! They sound super yummy and not too challenging to make!